This is Jamie Oliver's friend's Peter's lamb curry. Indian food usually seems so indulgent but besides the 1/4 T butter per serving there's not really anything bad for you in this, and you can throw in all sorts of veggies near the end. You can make the curry sauce one day ahead of time. I use lamb shoulder if I can't find shank. I usually halve the recipe. Preheat your oven to 325. Lightly toast the first 8 ingredients in a dry pan over medium heat until they smell good and darken a few shades, then grind them in a coffee grinder. If you are using pre-ground spices, just toast those. Chop the ginger, onions, garlic, chiles, and cilantro roughly, then add the spice mix and puree in a food processor. In a large oven-proof casserole or Dutch Oven, fry the pureed mixture in the butter for a little bit, stirring regularly. Jamie Oliver says "until it goes golden" but mine never does. Fry the lamb cubes in a little olive oil or cooking spray until golden, then add to the curry sauce and simmer for around 1 hour, until tender. 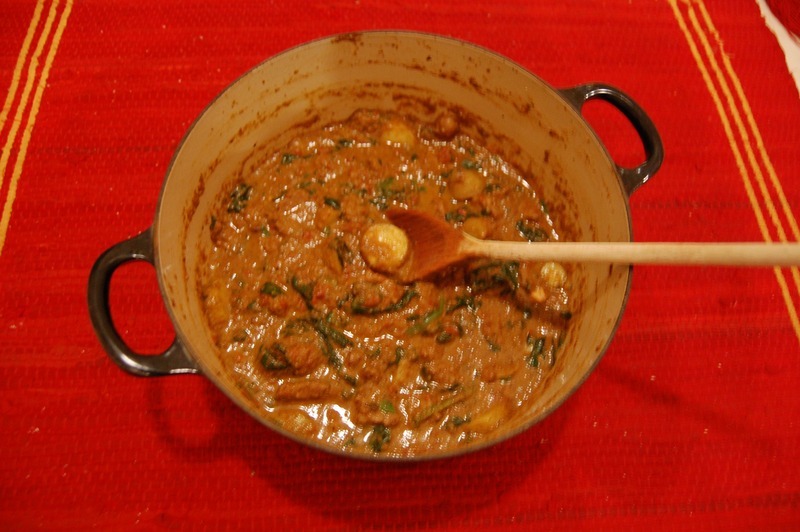 You can vary the curry by using diced chicken, shrimp, tofu, or paneer instead of lamb. You can also toss in any kind of vegetable or legume you like towards the end of cooking. I did spinach and leftover boiled potatoes. Okra would be delicious. Sprinkle the curry with the chopped mint and cilantro. Stir in the yogurt, add a good squeeze of lime juice, and season to taste with salt, pepper, or a little cayenne if you like it spicy. Serve with Indian breads, basmati rice, and cold beer. 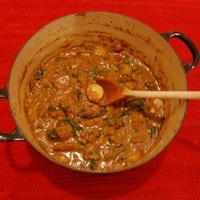 This is wonderful curry, I have made it before: ) I did want it a bit spicier though. This looks fantastic. Will try it this weekend! Thanks for sharing. Wow, this looks awesome, Maria! Can't wait to try it. Adding it to my "try soon" folder. Thanks for sharing.